EMU answered the call Saturday afternoon, thoroughly dominating Roanoke in an 87-71 win at home. 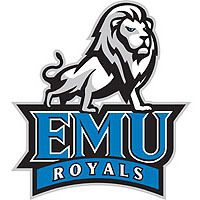 The teams entered the day in a three-way tie for fourth place in the ODAC standings, but EMU’s women led from start to finish and the outcome was never really in doubt. Eastern Mennonite led 79-43 after the third period in improving to 13-5 overall and 6-4 in the Old Dominion Athletic Conference. Roanoke slips to 9-9 and 5-5. The Royals now head into a key week, starting with Wednesday’s road game at rival Bridgewater College. When the two met Jan. 5 in Yoder Arena, EMU overcame a 17-point deficit to win in double overtime, 112-107. The women then host ODAC-leading Guilford next Saturday. Much like last Wednesday’s win at Virginia Wesleyan, a quick start set the tone for the game. EMU scored on their first four possessions to jump in front 10-2. The margin grew to 17-2 and 23-4 after a Lindsey Krisak (Alexandria, Va./Edison) three-point play just 6:08 into play. The women led 30-10 after the first period. Even as the Royals worked into their bench in the second, the cushion grew to 56-25 by the half. EMU out-shot the Maroons 56% to 27% over the first 20 minutes. They also held Roanoke’s All-ODAC forward, Cary Beahm, without a shot attempt in the half. Beahm entered the day second in the ODAC in scoring at 19.4 points per game. The Maroons grabbed some momentum to start the third, scoring the first 10 points. But EMU settled down controlled the remainder of the period, 23-8, to bump the lead up to 79-43 and effectively close things outs. The Royals finished with a 51% shooting clip, including 11-24 from long range. They were also 16-20 from the free throw line and had a 39-28 rebounding advantage. Boosted by the fourth quarter, Roanoke shot 44% for the game. Eastern Mennonite fittingly had a balanced team effort as everyone in uniform played at least six minutes. Jess Rheinheimer(Manheim, Pa./Lancaster Mennonite) dropped in 17 points, including 14 in the first half. Myneshia Walker (Freeman, Va./Brunswick) broke out of a recent slump with 15 points into a trio of three balls. Jazmine Carter (Fairfax, Va./Oakton) hit 10 points with four steals. Forward Jourdyn Friend (Richmond, Va./Meadowbrook) had a strong effort off the bench with 10 rebounds and eight points. Krisak had nine points and four assists, while fellow point guard Alicia Ygarza (Conestoga, Pa./Penn Manor) had seven assists and three steals. Jamella Foster led Roanoke with 16 points, five rebounds and four steals. Beahm finished with 14 points, all in the second half.